When Kathryn Knight had her 16th birthday party, in lieu of presents, she asked for Bike Fund donations. Kathryn wanted to do something in memory of her grandfather, Howard Knight, who passed away last year. 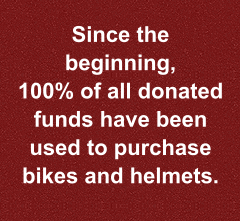 The guests donated funds to purchase 4 bikes honor the occasion. The teens (not all shown here) included Kathryn, Brittany Coggin, Courtney Mehlman. Kat Atkins, Cate Auerbach, Taylor Borkey, Laura Carpenter, Alexandra Ferrogiarro, Mary Ellen Goode, Caitlin Graham, Torre Grills, Hannah Heidenreich, Lelia Hoover, Jacqueline McNeil, Kathryn Ross, Abby Scott, Sophie Smith, Katy Stewart, Sudie Smith, and Maggie Daniels. SPOKESGROUP AND THANK YOU VERY MUCH!